Beach Lane Books, 9781481422949, 40pp. A master picture-book artist introduces quite young readers to two astonishing heroes of the world born in Pakistan...Winter, in impressive command of the page with her spare text and calm, rich, digitally rendered art, offers this difficult material unapologetically. As she often does, she distills the stories to their essences, conveying with very few words the fearlessness and the hope wielded by these children. Iqbal's and Malala's stories are presented as two separate tales, back to back. In a poignant double-page spread at the middle, edge-to-edge art shows each child atop a mountain. Iqbal's kite string has just left his hand; his kite drifts away toward Malala. Malala's kite string is still in her hand, and her kite reaches toward Iqbal...Brave and heartrending. In a two-in-one book that readers can begin from either end, Winter links the lives of two courageous child activists from Pakistan—Malala Yousafzai and Iqbal Masih. 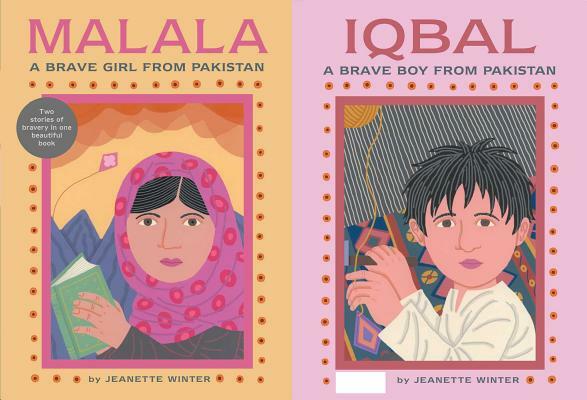 The pairing works to good effect; it is as if Malala stands on the shoulders of Iqbal...Winter’s spare prose and simple, colorful pictures illustrate both children’s circumstances and the mantles they accepted. An introductory note to each story provides a much-needed event summary. Readers will be moved by both sacrifices, and many will want to know more...This is an inspiring introduction to two important young champions of human rights. Winter (Henri’s Scissors) continues her series of illustrated biographies with a two-in-one volume...Naïf, milky-toned digital illustrations make the story’s terrors easier to bear...The thread joining these stories is the children’s thirst for education, no matter the cost. Readers who drag their feet to school may benefit...from an introduction to children who are desperate to attend. With an economy of words, unembellished language and her signature flat, child-centric illustrations, Jeanette Winter (The Librarian of Basra) creates a quietly magnificent tribute to two extraordinary human beings...The front-to-back story features Malala, the reverse tells the story of Iqbal, and Winter smoothly joins them together in the center spread. Malala's story opens as her would-be assassin descends upon her school van, then backtracks to tell how Malala spoke out repeatedly against the Taliban's ban on educating girls...Winter describes the Taliban attack, and Malala's miraculous survival, in simple, child-appropriate language...In the luminous full-page center spread, Malala and Iqbal stand on mountains, gazing at each other under a starry sky, flying kites that dance across to the other's side. Malala keeps a firm grasp on her kite string, while Iqbal releases his. Even as Iqbal's story saddens us, we must remember him in conjunction with Malala, living proof that hope thrives alongside death. Coupling the stories creates a whole greater than the sum of its parts. Winter has created a radiant, transcendent book. --Allie Jane Bruce, children's librarian, Bank Street College of Education Shelf Talker: The biographies of two children's rights activists, Malala Yousafzai and Iqbal Masih, together in one book; their stories balance each other to create a radiant whole. This picture book tells two stories (one side is Malala’s story; flip it over for Iqbal’s), introducing young readers to Malala Yousafzai and Iqbal Masih, two Pakistani children who fought for peace and justice and who both suffered violence...Winter tells each child’s story in clear, concise prose...Winter uses the imagery of a kite as both a metaphor for childhood and as a way to visually connect the two child activists. Mid-book, where the two narratives meet, a poignant double-page spread shows Malala, in vivid coral, flying a kite in a night sky, while Iqbal, shaded in an ethereal gray, can no longer hold on to his. Though both stories are painful, they can be a great place to begin a young activist’s education. Muted tones and doll-like representations of the two heroes soften the tragedy of the stories, and the inclusion of kites as symbols of freedom are used to advantage as the ghostly Iqbal and vibrant Malala exchange kites on the transition spread between stories. With Malala’s recent Nobel Peace Prize award (made after this title’s publication), this work will fill demand for material at a primary-grade level.